The health benefits of magnesium are clinically proven, but most Canadians don’t get enough through diet. 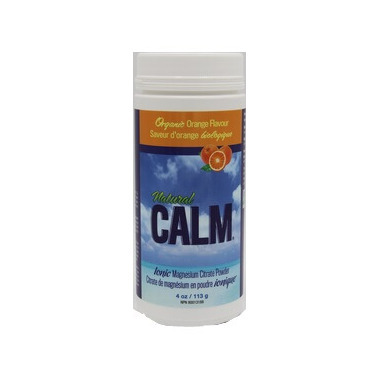 Natural Calm is the better-tasting, better-absorbing, best-loved magnesium drink. The proprietary magnesium citrate formula is fast-acting, to relieve stress, improve sleep, reduce pain, promote heart health and more. Backed by thousands of five-star reviews and dozens of awards, Natural Calm has been enjoyed and trusted for 38 years. Instructions: Pour about ½ cup of very hot water into a cup or glass. Add Natural Calm powder, let fizz, stir, and enjoy. Hot water speeds up the process whereby Natural Calm converts from a powder to a highly absorbable, ionic magnesium drink. Optionally, you may add Natural Calm to cool or cold water, or even to juice. Simply stir in and wait about 15 minutes, or until the mixture is completely clear – a sign that the magnesium is fully dissolved. Non-Active Ingredients: Citric Acid. Flavours contain organic stevia. Free from animal products, sugar, artificial sweeteners, flavours or colours, gluten-free, sugar-free and Non-GMO. Mechanism of Action: The citric acid combines with magnesium carbonate to create magnesium citrate, one of the most absorbable forms of magnesium available. Dosage: 2 teaspoons (5 grams) provides 100% of the daily requirement of magnesium for most men and women. Servings per Container: a 452 gram bottle of Natural Calm contains about 180 teaspoons; a 226 gram bottle contains 90 teaspoons. Caution: Some users experience a laxative effect, which is a natural side-effect of taking too much magnesium at any one time. If this should occur, simply reduce the amount of product you take at one time and increase the frequency, for example by taking Natural Calm twice daily. Note that comfortably loose stools are an indication that you are taking the right amount.